Issue #1 of this new series was released last week, pitting Dredd against the universe’s deadliest hunters, while they both face an onslaught by the xenomorphs, from the long running ‘Alien’ franchise. The next issue will be released on Wednesday , August 31st – and this edition looks set to bring the Predators to Earth, alongside other dramatic storylines, in this exciting crossover series. Published by Dark Horse, a press blurb from the company for this issue, reads: “Want to make apocalypse stew? Throw in four Judges, one insane genetic scientist, a smattering of emoji-based cultists, a dash of Predator, and a pinch of essence of xenomorph, mix, and retreat to the nearest bunker”. Apparently while the Predators are arriving on earth to rescue a kidnapped comrade, Judge Dread is in pursuit of a criminal cult leader and they both come across a deranged scientist who is experiment with xenomorph DNA. The scientist is ‘revenge-obsessed’ and is conducting trials involving gene splicing, somehow he has got hold of a xenomorph skull, which has the traces of alien DNA. 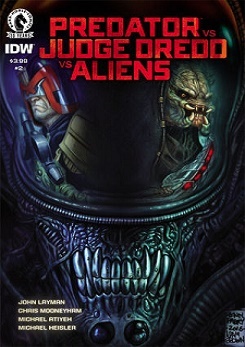 So a combination of Dredd, Predators, Aliens and some demented criminals sounds like a dangerous mixture of character collisions – should be a dramatic instalment in this series. This issue, like the first in the series is written by John Layman, with art by Chris Mooneyham, coloring by Michael Atiyeh and cover art by Glenn Fabry.